Modi’s carpet bombing-style rallies would overcome the negative image of the state governments in the elections, they thought. The corporate class in India is in a state of delirium and what medical experts call an “acute confusional state” of mind. The highfalutin and suited-booted executives are in this state of self-inflicted paranoia after the assembly election results in Rajasthan, Madhya Pradesh and Chhattisgarh. Six years ago, soon after the results of the Gujarat assembly election, which brought Narendra Modi to power for a third time as the chief minister, this class was ecstatic. The corporate chorus cheering Modi was led by Ratan Tata, Anil Ambani, Gautam Adani and even N.R. Narayana Murthy, the icon of Silicon Valley intellectuals. Stock market studs like Rakesh Jhunjhunwala and self-declared economist and psephologist Surjit Bhalla were on cloud nine. 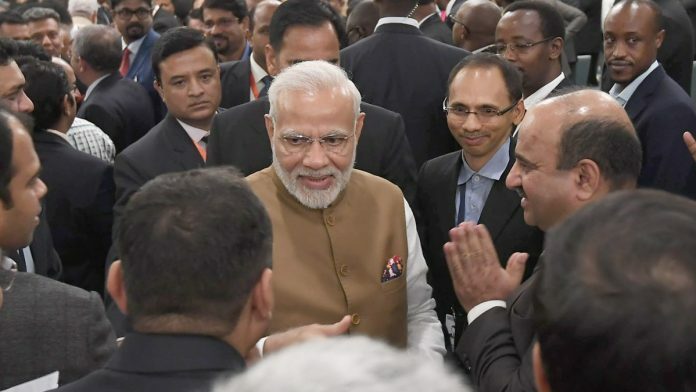 India’s Silicon Valley in Bengaluru and tech hubs in Mumbai and Delhi, along with much of the NRI community and their cousins, joined the Narendra Modi chorus. India was, they said, on the cusp of radical, neo-liberal transformation. Some wrote that India’s ‘Thatcher Moment’ has come. Others thought Modi could bring the ‘Ronald Reagan Revolution’ to India. This corporate class had huge support not just from the NRIs but also from the American business establishment. This hype reached its peak and the term “Modinomics” was coined. The decibel level of this corporate noise was so high that, some argue, it went to Narendra Modi’s head. The media likened him to ‘Alexander the Great’ (although surely he did not know about the history of Alexander). Sardar Vallabhbhai Patel suited Modi’s local idea of greatness and historical ignorance. The narrative that poor Patel had missed the opportunity to become the first Gujarati Prime Minister because of the alleged cunningness of Jawaharlal Nehru gained ground. So, Modi and his supporters made it a habit to attack Nehru as if he was still around and ridiculed his great-grandson Rahul Gandhi. So, it became a proxy war between Nehru and Modi. The WhatsApp warriors ferociously attacked the Nehru-Gandhi-led Congress – they excelled in the targeted and systematic maligning of personalities and communities like we have seen in German history. The corporate brigade, including highly paid IITians and IIM-syllabus trained young soldiers from various business schools, joined the vast army of social media outfits. Thousands of them found jobs with these troll armies. The alleged job was simple and the remuneration high: invent stories, generate calumny, spread slander, circulate fake news and destroy Nehru’s legacy. Interestingly, those who got mesmerised by this media blitz were executives working with big, medium or even small business enterprises. They actually believed that there was an inspiring dawn after a long dark Nehruvian night. This is when the myth of invincibility of Narendra Modi and Amit Shah began to get entrenched. The BJP’s majority in 2014 was attributed to Modi’s aggressive, imaginative and oratorical campaign. Therefore, the 2019 election, they thought, would be a repeat of 2014. The so-called semi-finals of assembly polls did not worry them much. Modi’s carpet bombing-style rallies would overcome the negative image of the state governments, they were sure. That is why the 3-0 performance of Congress shook them out of their complacency, and after four years, they have visibly lost confidence. At private gatherings and cocktail parties, in closed-door conference rooms and hush-hush conversations, they have begun to express their frustrations, total disillusionment and their business crises, especially after the chaotic implementation of the GST and the ‘mindless’ demonetisation. They are even expressing their fears and apprehensions about possible Enforcement Directorate or Income Tax raids. They are seriously concerned about the RBI governor’s resignation and the appointment of Shaktikanta Das, who is known neither as an economist, nor as a business-friendly officer. But the defeat of the BJP was significant in other respects too. Amit Shah’s alleged game of creating a fifth column in Chhattisgarh by encouraging Ajit Jogi-Mayawati alliance has miserably bombed. Jogi had already begun to behave as if he was the chief minister-elect. And Mayawati was threatening the grand old party as if she was the chosen candidate for prime ministership. ‘Who Rahul and What Congress’ was the refrain. But 11 December proved to be a ‘Black Day’ for all the anti-Congress parties and Rahul Gandhi detractors. The headlines on TV that night and in next day’s morning newspapers echoed: “Rahul Gandhi halts Modi Vijay Rath” or “Rahul halts Shah Juggernaut” or “The Son has Finally Risen”. The media loves hyperbole, and the win in the two big states (Rajasthan and Madhya Pradesh) was treated like it was a landslide. There was no Congress face in Chhattisgarh, but there was a landslide. The Telangana and Mizoram losses did not make headlines, because they were not ‘test matches’ like the ones played in the Hindi Heartland. But for the Supreme Court judgment on the Rafale deal, the BJP had lost face and its spokespersons their speech. (The court, however, has not addressed a single question posed by the Opposition, mainly the Congress. The issue of price and allocation of the Rafale offset project to Anil Ambani’s firm, allegedly sidelining the HAL, remains). The corporate executives and their masters, meanwhile, are in a state of panic now. One can empathise with them or laugh at them. Their oversized egos and delusion have created this Black Comedy-like situation now. It is indeed sad to read articles by Ketkar who is an elderly person, a senior journalist and now also a member of Rajya Sabha. He writes crudely, to say the least. Instead of barking at Modi, this time he has targeted fan club of Modi! Ketkar should know that BJP, after 15 years in power, is not really lost in MP and Rajasthan in terms of vote share. And 2019 is a different ball game altogether. This setback will give enough time for Modi to come back and all that he has to do is to announce a massive fame loan waiver, allow income tax threshold to be raised to 7.5 lacs or 10 lacs and announce a single or two tier GST to be implemented if he wins. Finally, all that voters seem to care is the benefit from the state for himself, his caste or his group, without any other overarching national considerations. If Modi is decides to go for this jugular, it will change the entire dynamics for him in no time, though the country will have to bear the consequences of the fiscal irrepsonsibility. Secular versus communal, nationalist versus liberal, Hindu versus Hindutva are all convenient political terminologies to be used when one is in power or out of it. In essence, Ketkar should hold his nerves till 2019! Having watched the IIT-IIM class from close range, I can say that almost all of them are very low on RQ — “Rootedness Quotient”. Like it is said, “an ambitious man has a thousand masters”, meaning, such a man will adopt anyone as his master who appears to fulfill his ambition. A derogatory label to portray such a man would be, “unscrupulous”: he will go with anyone who butters his bread. It can be a matter for research to find out if, in general, there is an INVERSE relationship between IQ and RQ? With due respect to all, wish to state that 2/3 rd of our country sleeps without food. Forget now till end of Kaliyuga, this country or any other country to that matter cannot be run by power point presentation and discussion on strategy. Ruler s who feel hungry of poor will rule. As a man of science and a physician, I am very well aware of the organisational belief of the Sangh Parivar, their lack of objectivity and irrationality and their mass delusional behaviour. Hence, when Modi led them in the 2014 elections and wanted to make the country great, my assumption was that he would emulate the rationality, objectivity, innovation etc that made other countries, strong, rich and great enough to help others and accept them in their fold (as fugitives or refugees or immigrants). Some of America’s & Europe’s greatest people in any field belong these categories. After becoming PM, Modi opened his mouth, I was initially surprised, then I thought what else could be expected, then I started laughing as things became even more ridiculous and when the killing of innocents started, I became angry. That lack of objectivity, irrationality and mass delusion was somewhere expected of a right wing party but my objection here is to the author being even more so. I have been following Surjit Bhalla since my school days. He was one of the advocates of liberalisation started by the Congress and has never wavered in his beliefs or has abused anyone. The authors use of the words “self – declared economist” was very surprising to me. Did the author not verify the credentials of Surjit Bhalla? Being a career journalist, can’t he do a minimum ground work and verify these facts before writing an article like this? Or does the author believe that imitation is the best form of flattery and has given up all decency to troll people who have worked for the BJP so that he can jump into their party? The author is a member of the Rajya Sabha. I have seen him on TV. Surjit Bhalla is far more decent in his debates or articles than this. The author needs to note that people are tired of this sort of behaviour from the current central government and its chelas and chamchas. He also needs to note that his own party is not devoid of faults of arrogance on the ground level and this is the sort of article that ends up reminding the people how the Congress and the media DID fool the people for decades. Mr. Kumar Ketkar’s views only expose his utterly stupid state of mind and his close proximity to novice RaGa and the corrupt Gandhi parivar. Wait for a while and see the pathetic demise of Choron Ka Gatbandhan. This is sad to read. Having graduated from one of the IIM myself, I can say that IIT/IIM folks are not different from anyone. Some of them are right wingers and many of them learn towards the other side. The way they are stereotyped and ridiculed is disheartening. A prejudiced article. If any talks about politics of today is nothing but an astrologer who predicts every day !! IIMs and IITs are the places to prepare for corporate excellence and nothing to do elections. IIT graduate and agriculture daily labour are equal and one vote each in a democracy. !! Only 10 % people read regional news papers and 1% of the population read English news paper. 90% of the population understand politics better than political analysts. 50 % of the election results are surprises. It is my request to the ‘Thr Print’ media, beginning not any article, you must mention the name of writer, so that we will not lost out time to study Cong mentality writer. When lalu prasad yadav was invited by IIM Ahmadabad for a talk on railways turnaround, I realized the potential of IIM Ahmadabad.it is very pathetical. The corporates saw a Thatcher in Modi but got a socialist buffoon. I really have high praise for this writer, because of people like this Hindustan will be ruined. And what u think u r doing Mr. KETKAR ? & Where were u in the last 5 years ? You have freedome of speech now ? Buy a mirror and watch your face in the morning while doing toothbrush. Dont shut your eyes whild doing toothbrush. Since Mr ketkar has dismissed Modi as illiterate PM,he must be a scholar and knows about concept of organic intellectual given by gramsci. If corporates are organic intellectuals for BJP,the elites in media and culture are same for congress. You are no different. I hope Mr Shekhar Gupta knows this. These partisan opinion style is luxury of developed nation. This bitter opinion style only suits guardian not in poor countries like India. Media here should not be driven by emotions but reason. Kumar Ketkar you yourself is a Joke. As if pappu wasn’t enough. These IIT IIM folks are basically greedy and dishonest folks, these lack basic common sense that ordinary common man has, I would say they are nothing more than stupid fools fooling people with their useless degrees who work for the white man. Wow.. so much of wisdom will overload my primitive brain. What exactly is your accomplishment. Jealousy? Looks like you’re just jealous that you haven’t achieved even a fraction of what they have. I don’t think senior business leaders would have been surprised by the Assembly election results. They are accustomed to dealing with a succession of governments, find their way around the regulatory thickets that still remain, much after 1991. Contrary to Shri Rahul Gandhi’s suit – boot jibe, the last few years have not been particularly good for India Inc. Nor should we buy into this rich – poor binary, of ordinary citizens welcoming demonetisation because the rich got hurt. When the economy is becalmed, all sections suffer, which is why the Assembly results have been so disappointing for the ruling party. If Surjit Bhalla is an economist, I am a fairly accomplished Bharat Natyam dancer. It is rather stereotypical to cluster all executives together in the same bracket with the presumptuous ignorance all of them supported Modinomics.